Busy schedules or clashing itineraries can get in the way of planning a vacation. But the rejuvenating year-end holiday escape is right around the corner on Sentosa, which is packed with a wide range of heart-stopping activities and luxurious retreats to cater to visitors of every taste. Shangri-La’s Rasa Sentosa Resort & Spa serves a stellar mixture of opulent comfort and hearty fun for adults and kids. The beachfront resort features 454 guest rooms and suites complete with private balconies and views of the sea, landscaped garden, pools and hill, with the Deluxe Garden View Rooms offering direct access to the hotel’s natural water swimming pools. With the newly launched A Slice of Fun room package, families can enjoy privileges such as access to the Toots Club for kids aged 5 to 12 and Mini Toots Club for those under 5, discounts off spa treatments, and a delectable set lunch at Trapizza, ensuring a well-planned and fuss-free stay. The Toots Club is a fully supervised hub with a wide range of facilities — such as a three-level slide that leads from a giant treehouse to a padded ball pit — and a rotating list of daily activities, as well as tasty catered lunches and dinners for children registered with the full-day programme. The Mini Toots Club is packed with storybooks, wooden toys, ball pits, baby rockers, and a giant block puzzle to engage younger guests. Surrounded by 3.8 hectares of lush gardens that are home to peacocks, squirrels, and other native flora and fauna, the Amara Sanctuary Resort Sentosa is an atmospheric hideaway that blends old-world colonial charm with modern luxuries for an exotic experience. Offering wrap-around views of both South China Sea and the pristine white sands of Palawan Beach, the Amara Sanctuary is an intimate space with just 140 guest rooms, suites and villas. Its latest Club Tiny package offers even more memorable moments for families with children: In addition to an adorable teepee bed and a safari-themed welcome pack for the kids in the family suite, it also includes daily buffet breakfast for a family of three, as well as dining credits at Shutters and vouchers from Spa Luna. Younger guests staying at the Amara Sanctuary for their birthday can look forward to celebratory decorations and a complimentary birthday cake. 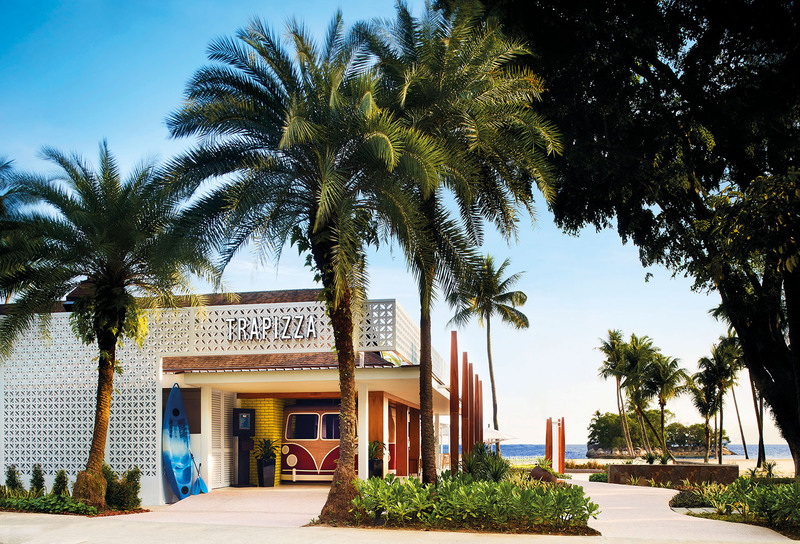 The sheer convenience of Le Méridien can’t be beat: With Imbiah Station and the Merlion mere steps away, the hotel is as an excellent launch pad for families to explore Sentosa’s various attractions. Enjoy more benefits with the Family Suite Discovery package, which includes a free round trip Sky Pass on the Singapore Cable Car and free Sentosa Express tickets for a family of four. Choose to stay in the colonial-inspired Heritage Suite or the Merlion Suite, which offers a stunning view of the iconic Merlion. Other highlights include complimentary dining at Latest Recipe for children accompanied by their parents, as well as an in-room sofa-bed for the little ones to recharge in comfort. Be treated like royalty at this newly refurbished Hard Rock Hotel Singapore, a property buzzing with fashionable jet-setters and A-listers. Rooms offer sleek, edgy interiors with sweeping views of Sentosa — the perfect setting to party like a rock star. A colossal free-form pool at the centre of the hotel is undoubtedly its standout feature, complete with a sunken pool bar, tropical landscaping and a man-made beach (sand here has been specially imported from Australia) that together deliver that exclusive Miami Beach vibe. Summer never seems to end at the W Singapore — Sentosa Cove. Soak in the moment at the hotel’s bacchanalian WET pool, a 1,338-sq-m sprawl open round the clock that features a snaking pool bar you can swim right up to for a dram. The pool is hard to miss, but if you must look for it, follow the pulsating music that thrums from the underwater speakers. Go longer and stay later as every room at W Singapore — Sentosa Cove has been built for parties of epic proportions; they are equipped with BOSE sound systems, mood lighting, and flamboyant interiors that can comfortably house even the most extensive guest list. Several suites even come with their own private plunge pools, bringing the pool party right to the doorstep. Atop a cliff lies the Sofitel Singapore Sentosa Resort & Spa. This alluring, private slice of paradise for couples features massive terraces and balconies that open out to panoramic views of the South China Sea. The resort’s acclaimed So SPA, tucked away amid its tranquil greenery, is a 6,000-sq-m divine profusion of indulgent delights. An outdoor spa garden replete with rich mud pools, meditative water labyrinths and cascading waterfalls beckon couples seeking a sanctuary for both mind and body. In such lush surrounds, where the signature scent of So Spa’s L’Artisan Parfumeur Jatamansi greets every visitor, surrender yourself to a variety of treatments, such as the 60-min So Rejuvenating facial, or the lavish 2.5-hour Five Elements Ritual, in one of 14 indoor treatment rooms or six outdoor spa pavilions. Get whisked to a different world that is the Capella Singapore. Ensconced in rich vegetation with stunning views of the South China Sea, the resort marries contemporary architecture with a lush tropical setting. The resort, located in the heart of a conservation site, offers some of the island’s most spacious accommodation — rooms start at 77sqm, while two Colonial Manors that date back to the 1880s span a whopping 436 sqm each. A hallmark of the Capella experience is the luxury of preferential service provided by Personal Assistants, while a bevy of excellent dining establishments includes Cassia (a Cantonese fine dining restaurant with interiors designed by Andre Fu), Chef’s Table, Bob’s Bar, and Mediterranean-style restaurant The Knolls, which serves up delectable meals in an inviting atmosphere. Both The Knolls and Bob’s Bar, with enthralling views of the hotel’s three cascading swimming pools and the ocean, make for the ideal date-night spot.